Egusi soup is a very popular and a much loved dish in most all of West Africa. Finding new ingredients is just one of the joys of this culinary journey around the world. 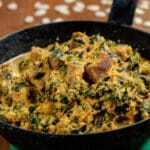 Egusi is a seed that comes from a inedible gourd that looks similar to a watermelon. The seeds must be roasted and they are delicious as a snack simply eaten whole. They are similar in size to pumpkin seeds and I would guess you could substitute them if you can’t get a hold of the real deal. I was able to find both whole and grounded egusi in my local African market. Here is a link if you want to pick up the real thing Egusi whole, Egusi grounded. It really is not a soup at all and not sure why they call it that. It is somewhat similar in texture to sauces or stews that are commonly served with fufu or rice. The flavor of this egusi soup as they call it, is superb. It is made with stock fish pieces and some beef, ground crayfish and some smoked catfish (I also found at my local African market) that was amazing. It is also flavored with either Maggi or Knorr stock cubes that seem to be ubiquitous in their cuisine. Tons of spinach or bitter leaves makes it a well rounded meal served with fufu or rice. A unique dish that will leave you wanting more. This would be a wonderful dish to try eating with your right hand as would be customary there. Take a ball of rice or fufu make a depression using your thumb. The depression in essence becomes you spoon to scoop out this delicious egusi soup. Believe me it takes some practice to get it right but it is a fun way to eat an authentic dish from Nigeria. Did you know that Nigeria is the most populous country in all of Africa? If you would like to learn more be sure to check out “Our Journey to Nigeria“. Here you will also find more authentic Nigerian recipes. 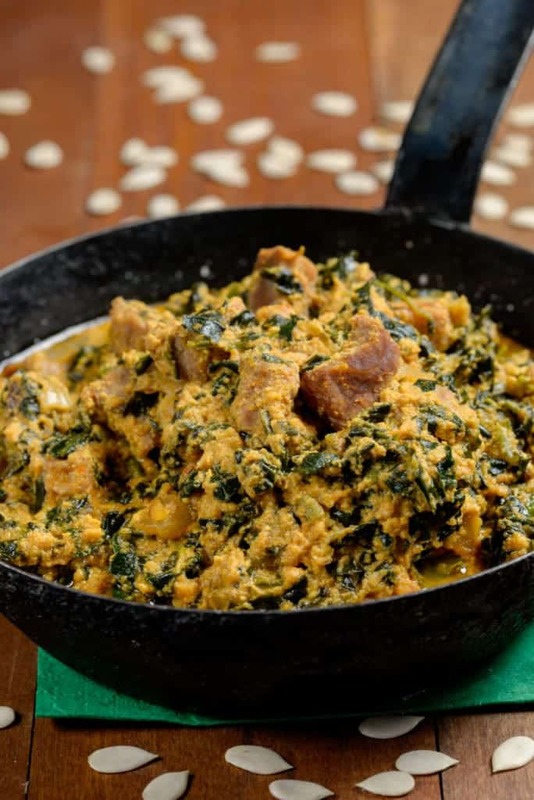 A delicious West African dish made with Egusi Seeds. Cut the beef into small cubes, Add in one chopped onion and one stock cube. Add half a cup of water and boil for about 10 minute or until tender. Set aside. In a pot, heat the palm oil and then add the egusi mixture. Stir well and let it fry for a few minutes. Add the blended tomatoes and stir well. Add in the grounded crayfish, second stock cube, stock fish and smoked fish. Add two cups of water and allow to cook for 5 minutes. Turn the heat down and simmer for a few more minutes. Continue to simmer for a further five minutes. Serve wtih fufu, or rice.